Angelic Nails (Pty) Ltd makes every effort to get your order to you as soon as possible. Orders are generally shipped within 1 to 2 working days after payment has been cleared. Weekend orders will be processed on Monday. Your order will then take another 1- 6 working days to reach you (depending on your location and shipping choice). Some orders might be subject to our verification procedure before we can process the order. For your protection from credit card fraud or identity theft, we may ask you to verify that you're the card owner or that the order and the ship-to information are legitimate. If your order requires verification you will receive an e-mail within one business day to advise you about the situation. Some orders might be subject to the interbank delay of up to 3 days for your deposited funds to reflect before the items can enter the shipping process. If we find that the product is not available we will contact you immediately. If we find that the item cannot be shipped within 5 working days, we will contact you with alternative options including the possibility of a full refund. You may use your postal address or physical address. The parcel will be delivered to the closest post office in your area. It will be the discretion of Angelic Nails (Pty) Ltd whether to refund or replace items. Cancellation of orders can be made within 7 days of purchase. Please notify Angelic Nails (Pty) Ltd so that the necessary arrangements can be made. 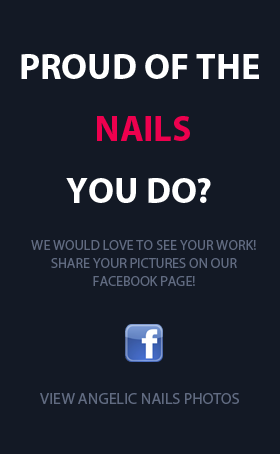 Due to the increasing threat of fraud Angelic Nails (Pty) Ltd reserves the right to use their discretion in this regard. Products must be in the same condition and un used for hygienic purpose. Postage will be for your own account and any method of return will be acceptable as long as the products are packed securely so that it doesn’t get damaged during transport. The refund will be processed once the products has been evaluated and excepted.